The aim of this study was to provide an overview of the recommendations regarding the diagnosis and treatment contained in current clinical practice guidelines for patients with non-specific low back pain in primary care. We also aimed to examine how recommendations have changed since our last overview in 2010. The searches for clinical practice guidelines were performed for the period from 2008 to 2017 in electronic databases. Guidelines including information regarding either the diagnosis or treatment of non-specific low back pain, and targeted at a multidisciplinary audience in the primary care setting, were considered eligible. We extracted data regarding recommendations for diagnosis and treatment, and methods for development of guidelines. We identified 15 clinical practice guidelines for the management of low back pain in primary care. For diagnosis of patients with non-specific low back pain, the clinical practice guidelines recommend history taking and physical examination to identify red flags, neurological testing to identify radicular syndrome, use of imaging if serious pathology is suspected (but discourage routine use), and assessment of psychosocial factors. For treatment of patients with acute low back pain, the guidelines recommend reassurance on the favourable prognosis and advice on returning to normal activities, avoiding bed rest, the use of nonsteroidal anti-inflammatory drugs (NSAIDs) and weak opioids for short periods. For treatment of patients with chronic low back pain, the guidelines recommend the use of NSAIDs and antidepressants, exercise therapy, and psychosocial interventions. In addition, referral to a specialist is recommended in case of suspicion of specific pathologies or radiculopathy or if there is no improvement after 4 weeks. While there were a few discrepancies across the current clinical practice guidelines, a substantial proportion of recommendations was consistently endorsed. In the current review, we identified some differences compared to the previous overview regarding the recommendations for assessment of psychosocial factors, the use of some medications (e.g., paracetamol) as well as an increasing amount of information regarding the types of exercise, mode of delivery, acupuncture, herbal medicines, and invasive treatments. The online version of this article ( https://doi.org/10.1007/s00586-018-5673-2) contains supplementary material, which is available to authorized users. Low back pain (LBP) is the leading contributor to years lived with disability . Non-specific LBP is defined as low back pain not attributable to a known cause  and represents 90–95% of the cases of LBP . The estimated point prevalence of non-specific LBP is 18% . Annually, total costs of LBP are estimated to be US $100 billion in the USA , €3.5 billion in the Netherlands , €6.6 billion in Switzerland , €17.4 billion in Germany , and AUD $9.17 billion in Australia . Although LBP imposes an enormous economic burden on healthcare systems, this condition is responsible to affect individuals’ daily lives. Hence, effective strategies play an important role to minimize the impact of LBP. Clinical practice guidelines provide evidence-based recommendations to assist decision making about health interventions. These documents, developed by expert panels, are normally updated every 3 to 5 years or if the available evidence suggests a reformulation of the previous document is necessary . A brief search of the Central Register of Controlled Trials (CENTRAL) reveals that the number of randomized controlled trials in LBP has nearly doubled since 2010. This finding suggests that some recommendations of clinical practice guidelines for the management of LBP may have changed in recent years. Since 2001, we have been conducting overviews of clinical practice guidelines for the management of patients with non-specific LBP in primary care settings [17, 18]. These overviews have summarized the overall consensus messages, any differences between clinical practice guidelines, the scientific support for the recommendations, and changes in recommendations over time. The importance of these publications is evidenced by the number of citations received; Web of Science citation index notes that the 2001 review  was cited 377 times and the 2010 review  316 times. It has been 8 years since our last review and some of the recommendations for the management of low back pain have likely changed. Therefore, the primary aim of this study was to provide an overview of the recommendations regarding the diagnosis and treatment of patients with non-specific LBP in primary care in current international clinical practice guidelines. 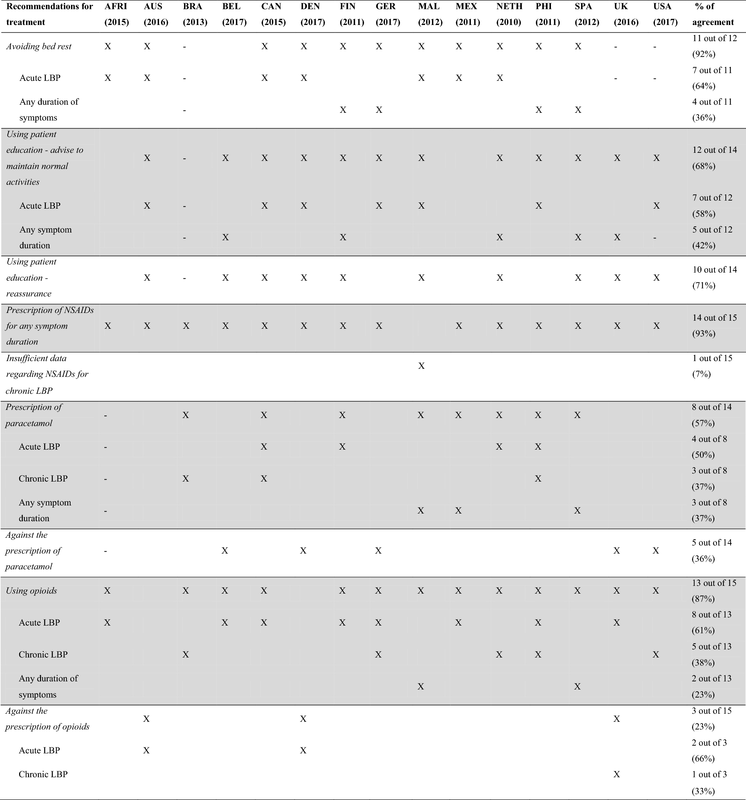 We also aimed to examine if recommendations have changed since our last overview. The searches for clinical guidelines were performed for the period from 2008 to 2017 in the following databases: MEDLINE via OVID (key words: combination of search terms regarding low back pain AND clinical guidelines), PEDro (key words: low back pain AND practice guidelines), National Guideline Clearinghouse (www.guideline.gov; key word: low back pain), and National Institute for Health and Clinical Excellence (NICE) (www.nice.org.uk; key word: low back pain). We also checked the guidelines included in our previous review for updates. Furthermore, we conducted citation tracking in the content and reference lists of relevant reviews on guidelines, completed a search of Web of Science citation index for articles citing the previous reviews, and asked experts in the field. Two authors (C.B.O. and C.G M.) independently screened titles and abstracts of the search results. In case of disagreement, a third author (B.W.K.) arbitrated. Guidelines including information regarding either the diagnosis or treatment of non-specific LBP, and targeted at a multidisciplinary audience in the primary care setting, were considered eligible. Only guidelines available in English, French, German, Portuguese, Spanish, Chinese, or Dutch were included because the authors can read these languages. For languages beyond these, we included English language summaries of the guideline if they contained sufficient information. We included one guideline per country unless there were separate guidelines for acute and chronic LBP. We also included guidelines issued by a multinational committee (e.g., Africa, Europe). If more than one guideline was considered eligible, we included the most recent issued by a national body (e.g., national pain society, or national health body). 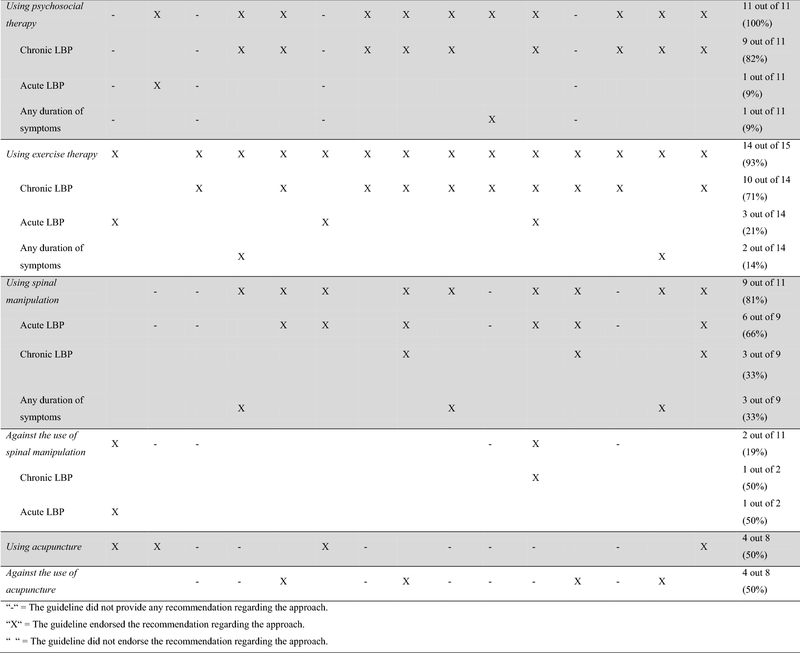 Two independent authors extracted the following data using a standardised form: recommendations regarding diagnosis and treatment, target population, committee membership, the evidence base of the recommendations (e.g., literature search, grade of evidence), consensus methods (e.g., committee meetings, discussion groups), and dissemination of guidelines (e.g., publication in website or scientific journals). To examine changes in recommendations over time, we compared results of the previous overviews with the current review. We presented the recommendations from the included guidelines in tables. Electronic searches conducted on June 16, 2017 retrieved 1611 records after removing duplicates. After the screening of titles and abstracts, we assessed 61 full texts against our inclusion criteria. Of these, we excluded 46 full texts because they were: not the most recent guideline issued (n = 19), not guidelines (n = 15), not targeted at a multidisciplinary audience (n = 10), and not in a language where we could obtain a translation (n = 2). Finally, 15 clinical practice guidelines [1, 3, 7, 9, 10, 11, 15, 20, 24, 27, 30, 31, 32] for the management of LBP were included from the following countries: Africa (multinational), Australia, Brazil, Belgium, Canada, Denmark, Finland, Germany, Malaysia, Mexico, the Netherlands, Philippine, Spain, the USA, and the UK. Six guidelines [1, 7, 11, 20, 26, 28] (40%) provided recommendations for patients with acute, subacute, and chronic LBP (i.e., Canada, Finland, Mexico, Philippine, Spain, and the USA), two guidelines [15, 31] (13%) focussed on acute and chronic LBP (i.e., Malaysia and the Netherlands), three guidelines [9, 25, 30] (20%) focussed on acute LBP (i.e., Australia, and Denmark), and one guideline  (7%) focussed on chronic LBP (i.e., Brazil). In addition, three guidelines [10, 24, 32] (20%) provided recommendations regardless of the duration of symptoms (i.e., Africa, Belgium, Germany and the UK). Therefore, ten guidelines contained recommendations for patients with acute LBP, six guidelines contained recommendations for patients with subacute LBP, and nine guidelines contained recommendations for patients with chronic LBP. Three guidelines [1, 11, 28] defined acute LBP as less than 4 weeks duration, two guidelines [6, 26] specified less than 6 weeks duration and four guidelines [15, 25, 30, 31] defined acute LBP as less than 12 weeks duration. The Canadian guideline  defined acute and subacute LBP as less than 12 weeks duration but without specifying the cutoffs for each one. All guidelines defined chronic LBP as more than 12 weeks’ duration. Table 1 describes the recommendations regarding diagnosis endorsed by each clinical practice guideline, and “supplementary material: Appendix 1” details these recommendations. Fourteen guidelines provided at least one recommendation regarding diagnosis of patients with LBP. The American guideline  did not provide any recommendation regarding diagnosis because the committee group was instructed to make only recommendations for treatment of LBP. Recommendations for diagnostic triage were found in 13 guidelines. Over half of guidelines [1, 7, 24, 25, 26, 31, 32] (7 out of 13; 54%) recommend diagnostic triage to classify patients into one of three categories: non-specific LBP, radiculopathy/sciatica or specific LBP. Almost half of the guidelines [3, 9, 10, 11, 15, 20] (46%) recommend the classifications of non-specific LBP and specific LBP without distinguishing the group of patients with radicular pain/radiculopathy. Most guidelines [1, 7, 11, 15, 20, 24, 25, 26, 31, 32] (10 out of 12; 83%) recommend history taking and physical examination to identify patients with specific conditions as the cause of the LBP. Box 1 describes the red flags endorsed by most clinical practice guidelines to identify serious conditions in the assessment. In addition, most guidelines [1, 7, 11, 15, 25, 26, 31] (7 out of 9; 78%) recommend neurologic examination to identify radicular pain/radiculopathy including straight leg raise test [1, 7, 15, 26, 32] and assessment of strength, reflexes, and sensation [1, 11, 15]. Only three guidelines [11, 15, 26] (3 out of 12; 25%) recommend an assessment that also includes palpation, posture assessment, and spinal range of movement testing. All guidelines recommend against the use of routine imaging for patients with non-specific LBP. Most guidelines [1, 7, 9, 10, 11, 25, 30] (7 out of 12; 58%) recommend that imaging should only be considered if red flags are present. In addition, five guidelines [1, 7, 10, 24, 32] (42%) suggest imaging when the results are likely to change or direct the treatment (e.g., invasive treatments), and two guidelines (17%) recommend imaging if pain persists beyond 4 to 6 weeks [7, 26]. Twelve guidelines contain recommendations for assessment of psychosocial factors, or yellow flags, to identify patients with poor prognosis and guide treatment. Most guidelines [1, 7, 9, 11, 15, 20, 26, 31] (8 out of 12; 67%) recommend the assessment based on a list of yellow flags reported in the guideline. Box 2 provides these yellow flags endorsed by most clinical practice guidelines. Four guidelines [10, 24, 25, 32] (33%) recommend assessment using validated prognostic screening tools (e.g., STarT Back and Orebro) which combine a number of yellow flags. The Danish guideline  recommends against targeted treatment for a subgroup of patients with specific prognostic factors. Regarding the optimal timing to assess yellow flags, most guidelines [7, 10, 11, 15, 24, 25, 32] (7 out of 12; 58%) recommend assessment during the first or second consultation. 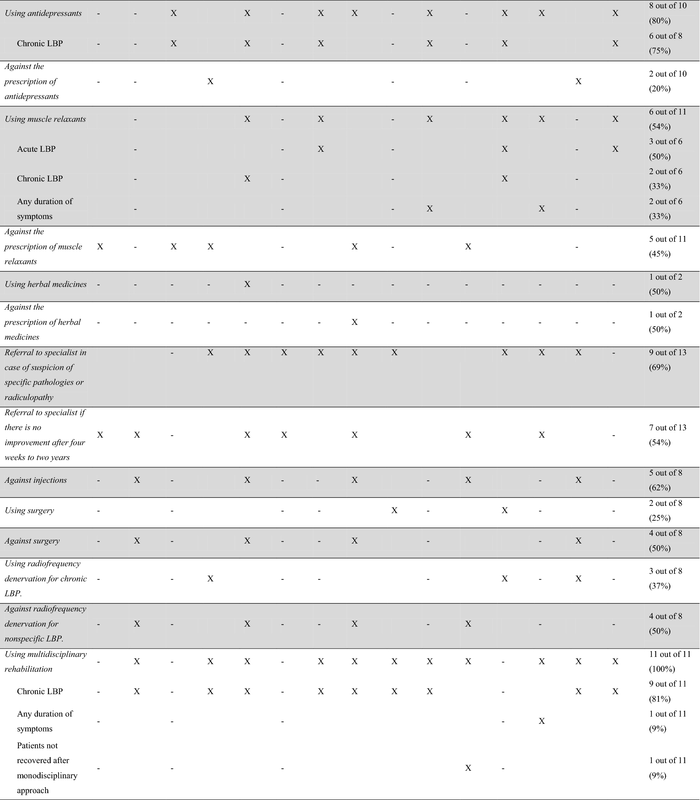 Table 2 provides the recommendations regarding treatment endorsed by each clinical practice guideline, and “supplementary material: Appendix 2” details these recommendations. All guidelines provided at least one recommendation regarding the treatment of LBP. Recommendations regarding bed rest were provided in 12 guidelines. Most guidelines [7, 9, 11, 15, 25, 30, 31] (7 out of 11; 64%) recommend avoiding bed rest for patients with acute LBP, and four guidelines [1, 10, 20, 26] (36%) recommend for any duration of symptoms. The only exception was the Belgian guideline  (8%) which notes an absence of evidence on the benefits or harms of bed rest when used in the short term. Recommendations on reassurance or advice for patients with non-specific LBP were identified in 14 guidelines. Most guidelines (7 out of 12; 58%) recommend advice to maintain normal activities for patients with acute LBP [1, 7, 10, 15, 25, 30, 32], and some guidelines (42%) recommend the same advice for patients with any duration of symptoms [20, 24, 26, 31, 32]. In addition, most guidelines (10 out of 14; 71%) recommend reassuring the patient that LBP is not a serious illness regardless of the duration of symptoms or reassuring patients with acute LBP of the favorable prognosis [7, 15, 20, 24, 25, 26, 28, 30, 31, 32]. The recommendations for the prescription of medication vary depending on the class of medication and symptom duration. Most guidelines (14 out of 15; 93%) recommend the use of nonsteroidal anti-inflammatory drugs (NSAIDs) for patients with acute and chronic LBP considering the risk of adverse events (e.g., renal, cardiovascular, and gastrointestinal) [1, 3, 7, 15, 24, 25, 26, 28, 32]. For paracetamol/acetaminophen, while most guidelines recommend in favor of this medication [1, 3, 7, 11, 15, 20, 26, 31] (8 out of 14; 57%), five guidelines [10, 24, 27, 30, 32] (36%) advise against the use of paracetamol. The Australian guideline  recommends the use of paracetamol but advises that clinicians and patients should be made aware that the medicine might not be effective. Most guidelines (13 out of 15; 87%) recommend weak opioids [1, 15, 24, 26, 31, 32] for short periods [3, 7, 10, 20, 31, 32], if there is no improvement with NSAIDs or other treatments. The guidelines recommend opioids for acute LBP [1, 7, 9, 10, 11, 24, 26, 32] (8 out of 13; 61%), chronic LBP [1, 3, 10, 27, 31] (38%), and for any symptom duration [15, 20] (23%). For antidepressants, most guidelines (6 out of 8; 75%) recommend its use for patients with chronic LBP where necessary [1, 3, 7, 11, 26, 28]. For muscle relaxants, most guidelines [1, 7, 11, 20, 26, 28] (6 out of 11; 54%) recommend this medication for acute LBP [1, 26, 28] (3 out of 6; 50%), chronic LBP [1, 7] (33%), and for any symptom duration [11, 20] (33%). In contrast, five guidelines (5 out of 11; 45%) recommend against muscle relaxants [3, 9, 10, 31, 32]. Two guidelines mentioned the use of herbal medicine for LBP (2 out of 15; 13%); one recommends its use for patients with chronic LBP , but the other recommends against it for any type of LBP . Recommendations for referral to a specialist were found in 13 guidelines. Most guidelines [1, 7, 15, 20, 24, 26, 30, 32] (9 out of 13; 69%) recommend referral to a specialist in cases where there is suspicion of serious pathologies or radiculopathy. In addition, most guidelines [7, 9, 10, 20, 25, 30, 31] (7 out of 13; 54%) recommend referral to a specialist if there is no improvement after a time period that ranges from 4 weeks to 2 years. Recommendations on invasive treatments (e.g., injections, surgery, and radiofrequency denervation) for non-specific LBP were identified in 8 guidelines. Of these, five guidelines (5 out of 8; 62%) recommended against the use of injections for non-specific LBP [7, 10, 24, 25, 31]. In addition, four guidelines [7, 10, 24, 25] (50%) recommend against surgery or radiofrequency denervation [7, 10, 25, 31] (50%) for non-specific LBP. 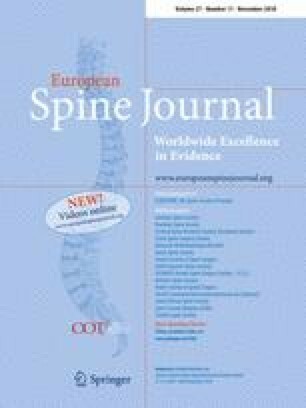 In contrast, three guidelines [1, 24, 32] (37%) recommend radiofrequency denervation for chronic LBP; however, two guidelines [24, 32] (25%) recommended only in strict circumstances such as lack of improvement after conservative treatment, a positive response to a medial branch nerve block, and moderate to severe back pain. Some guidelines recommend surgery for chronic LBP due to disk herniation or spinal instability [1, 15] and common degenerative disorders . Recommendations for multidisciplinary rehabilitation were identified in nine guidelines. Most guidelines (9 out 11; 90%) recommend multidisciplinary rehabilitation for patients with chronic LBP [7, 10, 11, 15, 24, 25, 26, 28, 32]. One guideline  recommends multidisciplinary rehabilitation for any duration of symptoms, and one guideline  recommends if there is no improvement after monodisciplinary approach. Recommendations for psychosocial strategies were found across eleven guidelines. Most guidelines (10 out of 11; 91%) endorse the use of a cognitive behavior approach [7, 10, 11, 20, 24, 25, 26, 28, 31, 32]. In addition, most guidelines (9 out of 11; 82%) recommend these therapies for patients with chronic LBP [7, 10, 15, 20, 24, 26, 28, 31, 32] with some of them recommending only if psychosocial factors are identified [15, 24, 31, 32]. All clinical practice guidelines provided recommendations for exercise therapy. Most guidelines (10 out of 14; 71%) recommend exercise therapy for patients with chronic LBP [1, 3, 7, 11, 15, 20, 26, 28, 31]. Noteworthy, we identified great discrepancy in the type of exercise program (e.g., aquatic exercises, stretching, back schools, McKenzie exercise approach, yoga, and tai-chi) and mode of delivery (e.g., individually designed programs, supervised home exercise, and group exercise). Guidelines provided inconsistent recommendations on exercise therapy for acute LBP. The recommendations for spinal manipulation and acupuncture vary across clinical practice guidelines. Eleven guidelines provided recommendations for spinal manipulation, and nine guidelines recommended its use. Most guidelines (6 out of 9; 66%) recommend spinal manipulation for acute LBP, but there are some discrepancies on the indications. The guidelines recommend spinal manipulation in addition to usual care , if there is no improvement after other treatments [7, 31], or in any circumstance [10, 28]. Three guidelines [15, 24, 32] (33%) recommend spinal manipulation as a component of a multimodal or active treatment program for patients with any symptom duration. Three guidelines (33%) recommend spinal manipulation as a component of a multimodal treatment program  or in any circumstance for chronic LBP . In contrast, two guidelines recommend against spinal manipulation for acute LBP  or chronic LBP . Similarly, the recommendations for acupuncture were inconsistent. Four guidelines [1, 7, 10, 28] recommend the use of acupuncture. Of these, three guidelines recommend acupuncture for patients with acute and chronic LBP [1, 28]. One guideline [7, 10] recommends acupuncture as an adjunct of an active rehabilitation program for patients with chronic LBP. Four out of eight guidelines do not recommend acupuncture [9, 24, 30] (37%) or state that acupuncture should be avoided  (13%). 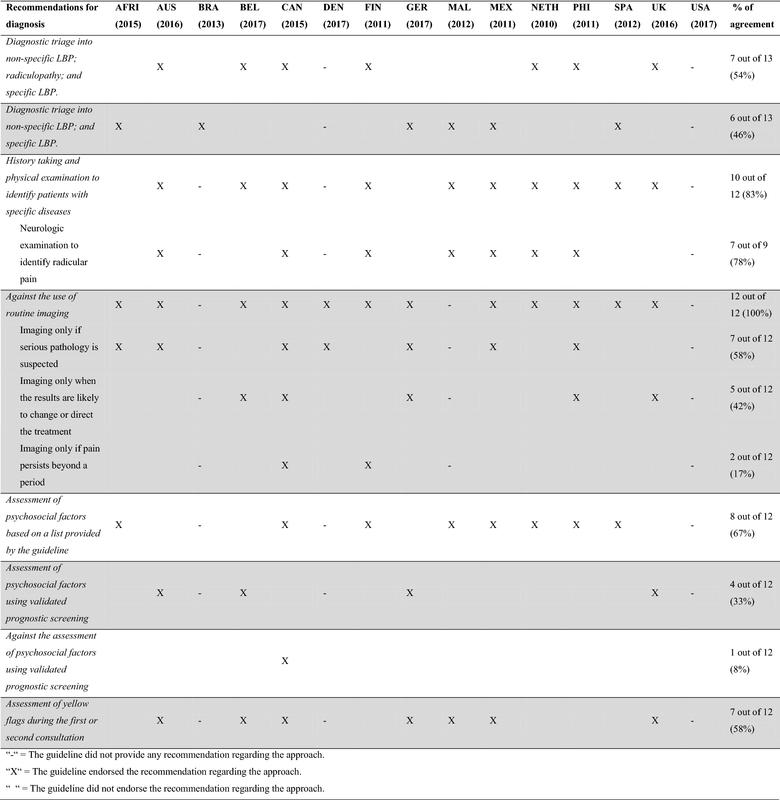 Table 3 provides the methods of development and implementation reported by each clinical practice guideline, and “supplementary material: Appendix 3” details these methods. Most guidelines [1, 7, 10, 11, 15, 20, 24, 25, 26, 28, 30, 31, 32] were issued by a multidisciplinary group including healthcare professionals such as primary care physicians, physical and manual therapists, chiropractors, psychologists, orthopaedic surgeons, rheumatologists, and radiologists. The African guideline  was developed by a medical group, and the Brazilian guideline  was developed by an association comprised of physiatrists. Most guidelines based their recommendations on systematic literature searches of electronic databases and previous version of guidelines (14 out of 15; 93%) [1, 3, 7, 10, 11, 15, 20, 24, 25, 26, 28, 30, 31, 32], evaluated the strength of the evidence (10 out of 15; 67%) [1, 3, 10, 11, 20, 24, 25, 26, 27, 28, 30, 32], and used consensus in the working group when necessary (11 out of 15; 73%) [1, 9, 10, 11, 20, 24, 25, 26, 30, 31, 32]. In addition, most guidelines gave direct links between the recommendations and the evidence (9 out of 15; 60%) [1, 3, 7, 9, 10, 11, 25, 30] and provided clear and specific recommendations (11 out of 15; 73%) [1, 7, 10, 20, 24, 25, 26, 28, 30, 31, 32]. In contrast, few guidelines provided sufficient information regarding their external review process (5 out of 15; 33%) [20, 24, 28, 30, 32] and the time frame for updates (4 out of 15; 27%) [10, 24, 26, 30]. Where it was reported, this ranged from 2 to 5 years. Most guidelines were available on the website of the participating organization, and some guidelines [3, 10, 11, 28, 30] were published in scientific journals. Most guidelines (9 out of 15; 60%) were accompanied by additional materials for dissemination [1, 7, 10, 20, 24, 25, 26, 31, 32] such as different versions for patients and clinicians, a care pathway, a summary version, an interactive flowchart, or videos. A few guidelines (6 out of 15; 40%) reported strategies or the barriers and facilitators for implementation [1, 20, 24, 26, 32]. Few changes were identified in the recommendations on diagnosis of non-specific LBP compared to the previous guidelines. Currently, most guidelines still recommend the assessment of psychosocial factors based on yellow flags at the first or second consultation. Of note, an increasing proportion (33%) of guidelines are recommending the use of validated prognostic screening tools (e.g., STarT Back screening tool or Örebro). Some recommendations changed compared to the previous guidelines for the use of medications for non-specific LBP. Our 2010 overview found a hierarchical order including paracetamol as the first choice and NSAIDs as the second choice. In this review, we identified that most guidelines recommend only the use of NSAIDs as the first choice for any duration of symptoms. Of note, most current guidelines recommend antidepressants, where necessary, for chronic LBP which was not endorsed by the previous guidelines. The recommendations regarding the NSAIDs and antidepressants were consistent across guidelines included in this review. We also identified more details on the recommendations regarding some approaches compared to the past guidelines. The current clinical practice guidelines suggest some types of exercise and modes of delivery for patients with chronic LBP compared to the previous guidelines which only noted the preference for using intensive training. We also found recommendations regarding some approaches in this review which were not previously cited in past guidelines such as the use of herbal medicines, acupuncture, and invasive treatments. However, the recommendations regarding these approaches were inconsistent or cited in a small proportion of guidelines (i.e., less than 50% of the guidelines). Fifteen clinical practice guidelines containing recommendations for non-specific LBP have been issued or updated since our last overview in 2010. For the diagnostic recommendations, guidelines recommend diagnostic triage (i.e., classification in non-specific LBP, radiculopathy/sciatica, and specific LBP), history taking and physical examination to identify red flags, neurological testing to identify radicular pain/radiculopathy, no routine imaging unless serious pathology is suspected, and assessment of yellow flags based on psychosocial factors cited in the guidelines in the first or second evaluation. For treatment of patients with acute LBP, most guidelines endorse recommendations for patient education, reassurance about a favourable prognosis and advice on returning to normal activities, avoiding bed rest, the use of NSAIDs and weak opioids for short periods when there is contraindication or lack of improvement with NSAIDs. For treatment of patients with chronic LBP, most guidelines recommend the use of NSAIDs and antidepressants where necessary, prescription of exercise therapy, and psychosocial interventions. In addition, considering referring to a specialist is recommended in case of serious pathologies or radiculopathy, or if there is no improvement after 4 weeks to 2 years. We identified discrepancies in the recommendations for the use of paracetamol, muscle relaxants, and herbal medicines. For paracetamol, the most recent guidelines [10, 24, 28, 30, 32] do not recommend this medication. This change might be attributable to recent studies demonstrating the lack of efficacy of paracetamol for non-specific LBP [29, 36]. In addition, the inconsistent recommendations for the use of muscle relaxants, and herbal medicines might be attributable to different care settings and cultural context across the countries. Most guidelines recommend the use of weak opioids for short periods if NSAIDs are contraindicated or not effective for patients with acute LBP, despite an absence of relevant clinical trials as demonstrated by a recent systematic review . Considering the rising prescription of opioids , the use of this pain medication has been discouraged due to the small benefit on pain intensity in chronic LBP as well as potential side effects (e.g., misuse or physical dependence) [2, 23]. Although the current review found that most guidelines recommend opioids for acute LBP, this recommendation is not supported by the evidence and may result in increased harms for patients with non-specific LBP. The recommendations on spinal manipulation and acupuncture are inconsistent but in different aspects. The recommendations on spinal manipulation vary mainly regarding the circumstances in which the intervention should be administered (e.g., any circumstance, in addition to usual care, after lack of improvement). The recommendations on acupuncture have discrepancies related to its use in patients with non-specific LBP. In addition, four guidelines [1, 7, 10, 28] recommend acupuncture, but disagree regarding duration of symptoms. These discrepancies might be attributable to the lack of high-quality evidence which may result in recommendations based on group consensus considering different aspects. Future studies should be conducted to clarify these recommendations. Although the number of randomised controlled trials has nearly doubled since 2010, the recommendations regarding management remain similar compared to the previous review. We identified an increasing proportion (33%) of guidelines recommending the assessment of yellow flags using prognostic screening tools [10, 24, 25, 32]. This might be attributable to a recent randomised clinical trial that showed small improvements from targeting treatment based on responses to a validated prognostic screening tool . However, this was based on one study only, and a recent review  found that screening tools poorly identify patients who will develop chronic pain and worse outcomes in patients with LBP. Future studies should be conducted before any definitive conclusion can be made regarding the use of prognostic models. The guidelines still uniformly recommend exercise for chronic LBP. However, the clinical practice guidelines are now suggesting a greater variety of types of exercise. For example, guidelines include options such as sports rehabilitation, physical activity as tolerated, aquatic exercises, stretching, aerobic, strength training, endurance, motor control exercise, yoga, and tai-chi. Although the guidelines endorsing some types of exercise increased [1, 7, 20, 24, 26, 28], there is no consistency in the recommendations favouring one particular modality. Hence, we would argue that the choice may rely on patients’ preferences and therapists’ experience. Our overview included clinical practice guidelines that issued recommendations for patients with nonspecific LBP. Although some guidelines also include recommendations for different types of LBP, future studies should investigate the recommendations for radicular pain/radiculopathy and specific LBP. Another limitation of this review is the absence of quality assessment of the guidelines using a validated tool (e.g., AGREE). Nevertheless, we provided an overview of the methods of the clinical practice guidelines included in the current review. Based on the recommendations for the development of guidelines for LBP provided by the previous review, the methods for developing the guidelines seem to have improved over the years (Box 3). Most guidelines provided a description for obtaining the evidence to be used in the recommendations, with some describing the method for assessing the strength of the evidence (Recommendation 1). However, only two guidelines [20, 30] (13%) included non-English publications (Recommendation 2). The target group and the committee of the guideline were well described (Recommendations 3 and 4). A substantial proportion (53%) of guidelines provided a direct link between the evidence and recommendations (Recommendation 5). Although an increasing number of guidelines reported details regarding the consensus methods, this topic was still not appropriately described by the guidelines (Recommendation 6). One issue that remained over the years was that the clinical practice guidelines did not often incorporate information regarding effectiveness and health benefits as well as the cost-effectiveness (Recommendation 7). As mentioned earlier, the strategies for dissemination of the guidelines have improved substantially with several types of materials available for patients and clinicians. However, although the details regarding implementation also improved, most guidelines did not specify the strategies as well as the barriers and facilitators for implementation in the clinical practice (Recommendation 8). In addition, few guidelines [10, 24, 26, 30] provided the methods and time frame for updating (Recommendation 9). The current clinical practice guidelines recommend diagnostic triage using history taking and physical examination to identify red flags and neurological testing to identify radicular pain/radiculopathy, against routine imaging unless serious pathology is suspected, and assessment of yellow flags based on psychosocial factors cited in the guidelines in the first or second evaluation. For acute LBP, most guidelines endorsed recommendations for patient education, reassurance about the favourable prognosis and advice on returning to normal activities, avoiding bed rest, the use of NSAIDs and weak opioids for short periods where necessary. For chronic LBP, most guidelines recommended the use of NSAIDs and antidepressants where necessary, prescription of exercise therapy, and psychosocial interventions. In addition, referring to a specialist is recommended in cases where there is suspicion of serious pathologies or radiculopathy or if there is no improvement after 4 weeks to 2 years. C.B.O. was supported by Capes Foundation, Ministry of Education of Brazil. CGM is funded by a Principal Research Fellowship from the NHMRC (APP1103022). ACT is funded by an Early Career Fellowship from the NHMRC (APP1144026). C-WCL is funded by a Career Development Fellowship from the NHMRC (APP1061400). C.G.M. reports receiving lecture fees from Pfizer. No other conflict of interest relevant to this article was declared.